Designed as a portiere, or “door curtain” in French, Wooden hills tapestry is part of the larger work known as “The Jagaloon Tapestries”. 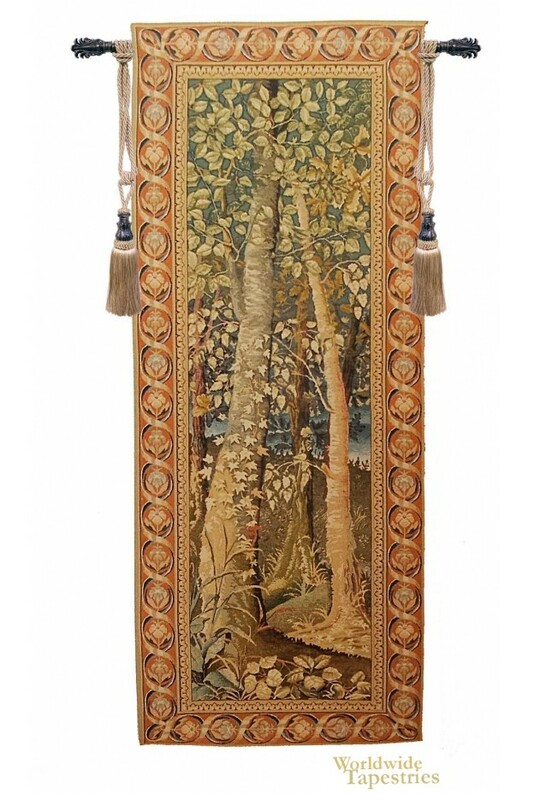 A series of seven individual pieces – The Forest, Iris, Woody, Timberland, Underwood, Woodland and Wooden hills – the tapestry was originally commissioned by the King of Poland during the mid 16th century. Portieres trace their origins to the need for door coverings during cold winter months in unheated castles and estates. They originally were made of silk with fanciful embroidery. “Wooden hills” looks even more impressive when displayed in pairs with other portieres from “The Jagaloon Tapestries”. The detail and depth of this tapestry is simply gorgeous. Wooden hills tapestry is lined and has a tunnel for easy hanging in your home. Note: tapestry rods and tassels, where pictured, are not included in the price.